Please fill up the form below and we will post all the paper sample below to you for free on next working day. The paper sample kit only post to valid Singapore address. These paper sample that we have prepared is popular paper use for business card printing and many other products. 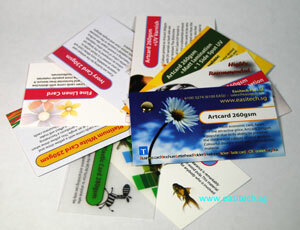 Beside name card or business card material, you may also do a remark if you required sticker or brochure material. If you did not receive your paper sample in 3 working days, please email or call us. Thanks.